Defense will be key for Indiana’s progression this year. Newcomers are expected to contribute at North Texas this season. Oregon plans to exceed expectations. Wyoming has spent the last three weeks defining roles and positions. New-look UConn will take the court for the first time this season tomorrow night. They will be in the spotlight. ESPN’s preseason top 25 rankings. A Juco coach who bled blue helped Evelyn Akahtor fall in love with Kentucky. Oregon State’s freshmen are ready to continue the program’s success. Katelynn Flaherty’s passion for the game fuels her prolific scoring at Michigan. Rebecca Greenwell was showing out yesterday at Duke’s scrimmage. Blair Schaefer brings leadership to Mississippi State. 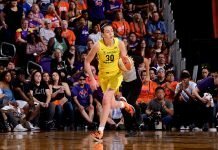 Washington guard Kelsey Plum is headed to Connecticut for ESPN/NCAA Media Day. Hampton’s Malia Tate-Defreitas is expected to be ready for the opener after knee surgery. UConn was fun to watch, but five-star recruit Desiree Elmore saw her future with Syracuse. ESPN’s top 25 players, 21-25. No Tyler Scaife causes Rutgers coach Vivian Stringer to think of the 2001-2002 season. An era has ended at UConn, but coach Geno Auriemma’s aura carries on. Rutgers will retire Cappie Pondexter’s jersey Dec. 1. League MVP Nneka Ogwumike was honored by her former high school a few days ago. Tamika Catchings’ new job is leading the Indiana Colts. Thank you for compiling all these great stories. I am so excited for the college season to start. I’m going to check out your new posts as often as possible.